It’s been a little over two weeks since we moved to Cali. We left the hustling bustling city of Chicago to move to the small beach town, Encinitas. The population here is 60,000. There is a small “downtown” with a strip of shops, cafes, and restaurants. My first week here I went downtown to have lunch and dig into my school work. The restaurant I ate at had an amazing array of organic, gluten, and dairy free food options yet no internet. I decided to eat and write and enjoy my lunch. Afterwards, I ventured down the street to a coffee shop where I got the most delicious chai tea latte. I settled into my seat, opened my computer and wrestled with my internet for ten minutes. After exhausting every option that I could think of, I looked at the guy sitting next to me and asked if his was working. Turns out the internet was down that day. Apparently the internet is a wide spread issue here. Some coffee shops intentionally don’t offer it. The other ones, you have a 50/50 chance of it actually working. In some ways being here is like going back in time 20 years. There is a magical quality to the people and area that is difficult to describe. It has the same vibe as Byron Bay, Australia or Tulum, Mexico if you have been to either of those places. Essentially, they are places that carry a lot of positive energy that becomes contagious in the best sort of way. Last Thursday night Chris and I ventured “downtown” for a date night. 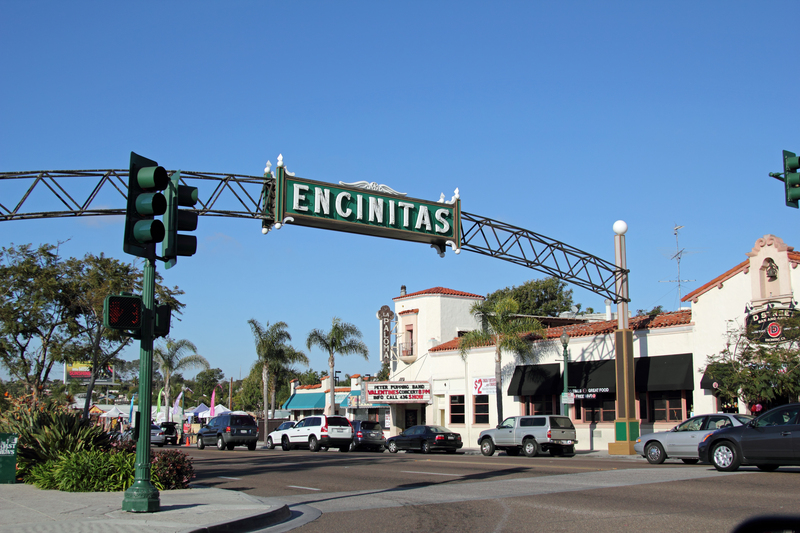 We stumbled upon the monthly Encinitas community night. The streets were filled with old show cars, music, and smiling faces. We ended up at a vegan restaurant, Eve, that we had been told about by Chris’s friend. We ate delicious food, drank kombucha, and met at least a dozen people. We were greeted with hugs instead of handshakes. We found the people we met to be very open, welcoming, and stimulating. Instead of discussing careers, we were asked what we did for service, and what our creative outlets were. We had truly interesting conversations and I found myself lost in the energy of the people around me. Not once in three hours did I look at or even wonder what time is was. The only time that it occurred to me that maybe we should go home was when one of our new friends told us goodbye and said, she was “putting herself to bed”. I left that night buzzing, but not by alcohol. Unlike any typical night out in Chicago, alcohol wasn’t even present. The restaurant was totally “dry”, offering only water, smoothies, and fermented beverages. I honestly can’t remember a night in my adult life where I had more fun without having a single cocktail. Sad as it may sound, the only times that I went out and didn’t drink was when I was either A. pregnant or B. consciously deciding to take a break. I found it to be uplifting and encouraging to be able to have such a good time in the absence of alcohol. To me this is just part of getting comfortable with the uncomfortable. Things are different here. Typically different makes me squeamish with fear. Slowly I can feel myself relax into the change, and maybe even become excited by it. Thank you for reading and sharing my passion. As always, if you love what you read, please share it. If you are reading this, thank you. I know it’s been months since I’ve written. I’ve meant to write. I’ve sat down and tried. I fell flat. It’s not that I haven’t had anything to say. The past four months have been challenging, exhausting, exhilarating, scary, and insightful. Our year started with water damage through two stories into our kitchen. Less than a month later my husband got fired from the company he started over ten years ago, by his two partners. We had months of sick children. I was convinced that our house was making them sick. We’ve had months of our home being in disarray…plastic separating the first and second floors with zippers to get through them. Construction workers have been in and out, in and out. Meanwhile, we have been doing some soul searching and asking ourselves some real questions. We’ve had the luxury, and sometimes the curse, of deciding our future. We’ve wrestled with whether or not to move, and then whether we go to L.A. or San Diego. We’ve traveled to Miami (twice), L.A., San Diego (twice), Ohio. Chris totaled his car and thankfully walked away unscratched. He went to Peru for two weeks on an amazing, life-changing journey. Meanwhile, I over-flowed the bathtub and caused even more water damage to our house. I started journaling again; a practice I’ve done since I was a kid, and have abandoned in the last few years. This year has been a whirlwind and we are still in the midst of it. Yet, through it all, I’ve so grateful. We are moving in June to Encinitas. Our boys are heathy. My marriage is growing. I’ve gotten to know myself a little better. I’ve learned to lesson my grip on things just a little bit. I’m reminding myself that being imperfect is my right as a human being. I’m learning to speak my mind instead of biting my tongue. I’ve been reminded of what is truly important and that stuff is just that. I’ve met and connected with old friends and new. I’ve forgiven. His partners. Myself. Chris. Family. I’ve meditated. I’ve reminded myself again and again that we are all doing the best we can. I’ve decided to make myself a priority. After almost five years of being a mother and wife first, I feel something being stirred inside. I feel a growing purpose to use God’s gifts to do other things in this life. Our boys are almost two and four. They are wonderful and exhausting. My love for them has only grown but my view of them has shifted. I don’t want them to be my whole world and vice versa. I’ve always thought that it’s so interesting to raise children to spread their wings and fly. Instead of holding on with all of my might now, I’m working on allowing them to spread their wings so that they don’t leave me with a giant hole in the future. I’m learning what unconditional love really means. I’m learning that in this life, we are all on our own journey. I have been so blessed to have such amazing people to hold my hand along the way, but in the end, it is only me who will ever walk in my shoes. I’m still in school. Our home is still currently under construction. We are moving in 6 weeks. My family still comes first but with all that being said, I think that my blog may need to undergo some changes. My life isn’t only about dumb bells and rattles anymore. Sure, it’s about being a mom to two silly boys, but it’s also about increasing my awareness, connecting with others, new adventures, and healthy living. In the months to come, I hope that my blog will be able to showcase all of this. Thank you again for reading. This blog feeds my soul and I hope in some small way also touches yours. As always, if you like what you read, please share.